Please check the Calendar of Events for the latest schedules. (You do not need to be registered for these sessions - you can just turn up and play. This session is designed for players who would like to fit in a badminton session between work and dinner. It is aimed mainly at players of around Division 2 to Division 3 standard. Alan Bottomley (0417 346 701) usually manages this session. This session is open to everybody. Join in the fun with this Ladies only session. Shuttles are not provided - please bring shuttles. Shuttles & racquets are provided. It is run by Vicky Zhang. This session is open to everybody while offering casual badminton at a family friendly time. This session is managed by Donna Meaghan. This session was originally started by a group of "Over-40" players (hence the name Vets), but now anybody over 30 is welcome. This session is managed by Henry Nissink. This session is open to everyone. A casual session is conducted on Wednesday mornings from 9:30am to 12:00pm. For more information please go to the Hobart Ladies Badminton Association website. There are various coaching sessions conducted during a typical week. Mostly you would need to contact one of the coaches before attending one of their sessions. The night roster is the main activity conducted by the STBA. It typically involves around 150 players in about 30 teams and 4 divisions. The STBA conducts 3 rosters per year; Summer, Autumn and Winter. To play in one of these rosters you need to enter via the Nomination page before the roster starts. Weeks of awesome badminton games & coaching 8 - 18 years in teams format for all abilities! Cost is $80.00 per junior - Great value with racquets and shuttles provided. The Rosters are run on Saturday afternoons (2:00~4:30pm) during school terms but not during school holidays or when there is a weekend tournament at the badminton centre. Donna Meaghan organises and manages this Roster. Love your doubles? You might be interested in a trial doubles competition running for 5 weeks. For registered platers the cost is $50.00 for the 5 weeks ($75 for unregistered players), payable on the first night with players supplying their own shuttles. Anticipated shuttle usage is approximately 2 per player per night and shuttles will be available for purchase on the night. Maximum of 32 players. High School Roster 4pm~6:30pm Friday afternoons. This is a teams roster for High School students. Most of the games are at the South Hobart Badminton Centre but some of the matches use school facilities. The roster runs from mid May to around the end of August but not during the school holidays. Typically there are about 60 teams from the various High Schools in the Hobart area. Click here for more information. This competition is coordinated by Rowan Henderson and Rose Meaghan. This is a teams roster for College students, similar to the High Schools roster (above) and runs from mid May to end of August. Typically about 20 teams compete. Click here for more information. This competition is also coordinated by Rowan Henderson and Rose Meaghan. 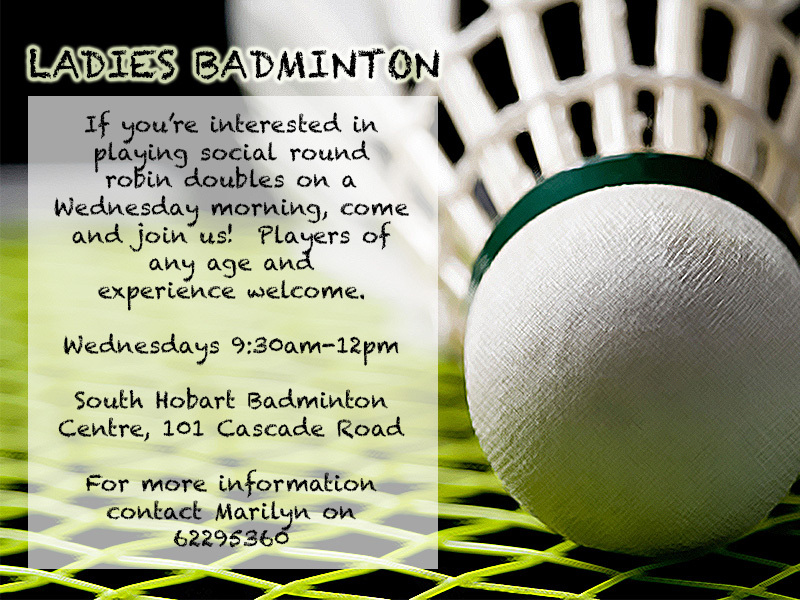 Hobart Ladies Badminton, Tuesday, Wednesday and Thursday mornings 9:30 am to 12 noon. The Hobart Ladies Badminton Association conduct 3 sessions each week, (Tuesday, Wednesday and Thursday mornings). If you would like to join one of these sessions or the Ladies casual session, please initially please go to the HLBA website. This is typically conducted during a weekend in May. It is open to everyone. Typically conducted in early May. See our Calendar of Events. You need to be registered with an afilliated club (such as the STBA) to play in this tournament. Events usually offered are: Open Mens Singles, Open Womens Singles, Open Mens Doubles, Open Womens Doubles, B-Grade events, C-Grade events, D-Grade events (sometimes), U15, U17 and U19 events. This is a Teams event and is usually conducted on the second weekend in June. It is open to all players aged over 35 and is patronised by players from all around Tasmania. The carnival, which is a 2-day event, has been held every year since 1990. The entry fee is currently $35. There are also Veterans carnivals conducted each year in Launceston (usually in July) and Burnie (usually in September). Check the Calendar of Events for more details and links to entry forms. Usually conducted during June or July. See our Calendar of Events. Usually conducted during August. See our Calendar of Events. The venue for this tournament rotates around between the North Western, the Northern and the Southern badminton venues: 2015:Burnie, 2016: Launceston, 2017: Hobart. (You need to have been selected into a State Team to play in one of these). This is the national competition for the senior teams from the various States and Territories around Australia. In 2014 it was held in Geelong, Victoria. In 2015 it was hosted in Hobart ! Rotates between venues around Australia. In 2014 it was hosted in Launceston. Rotates between venues around Australia. In 2012 it was hosted in Hobart. Rotates between venues around Australia. In July 2014 it was hosted in Hobart.